There is a great buzz going around about DJI and its recent release of some amazing quadcopters. Just this month it announced the new Phantom 4 Professional and the Inspire 2. Both of those quads are designed for professional image capture and will certainly cause a stir when they are released to the public. However, it’s the October release that everyone is now talking about. The DJI Mavic Pro is a one-of-a-kind quadcopter that promises to be a huge hit with first time drone buyers. It is small, easy to fly, and takes very good quality video and pictures. No one has seen a drone that folds down like this before and that alone means that many people will consier it because it is so small and easy to take with you on adventures. But in addition to being portable, the DJI Mavic Pro is also an amazing piece of technology. Using the same camera sensor as the Phantom 4, this compact little quad has many ground-breaking features that are sure to become standard in high end quadcopters going forward! Not to beat the point to death, but the DJI Mavic Pro is small. It weighs just 64 pounds (743 g) and is 83mm (height) x 83mm (width) x 198mm (length) when folded down. This is much smaller than the Phantom series and makes it easy to throw into a backpack or small shoulder bag. It has the same camera sensor as the Phantom 4 but a smaller lens that takes 4K video and photos up to 4,000 x 3,000 pixels. It features a 3-axis gimbal that tilts smoothly via remote control. It has five vision-positioning cameras that help it avoid obstacles and land smoothly every time. And while it does not have an HDMI port out, DJI is promising a compatible 1080p First-Person-View (FPV) headset that will take full advantage of the 1080p streaming for up to 4.3 miles (seven kilometers). In addition to all the amazing hardware, it also uses the DJI Go application for iOS or Android, which is a very robust software package. With the DJI Go app, you get full telemetry and the ability to fly the quadcopter in a variety of “advanced” flight modes like follow, trace, orbit, profile and more. But if you don’t want to use your phone or tablet as part of your transmitter, then no problem.You can fly the quad just using the included, video game style remote. The remote has most of the telemetry that you get using the application, but you don’t get the live video feed using just the remote. On the flip side, you can also fly the DJI Mavic Pro using only your phone or tablet through the DJI Go app. I’ve tried this, and while it works, the flying experience is diminished considerably in this WiFi flight mode. As you can probably tell, the Mavic offers a large number of features, but don’t let this intimidate you. If you just want to do the basics – fly, get good video/pictures, and have fun – then you can certainly do that. The Mavic is simple enough for beginners but has enough features to keep even the most seasoned pilot engaged for a long time! The DJI Mavic looks like a robotic grasshopper when it is folded up, but when you first pick it up, you can tell that it is well built! With its combination of plastic, aluminum and rubber, it feels very solid and well made. The hinges that operate the legs are easy to unfold and seem built to take the abuse of constant use. The bottom of the craft has a big aluminum section that seems to double as a landing skid and heat dissipation area. The propellers snap on and off quite easily but feel very solid when they are attached to the craft. The remote control feels like a video game control unit, but even better built. It has a very nice feeling with responsive joysticks and thick rubber brackets to hold your phone or tablet in place as you fly. The only complaint that I have so far is in the way you attach your phone to the controller. You have to find the sweet spot where the phone fits into the two fold out arms that hold it and the lightning or USB cable connections. It takes some work to get the cable plugged in. And once your phone is in place, its difficult to hit the “home” button on your phone in order to get into the menus. So be sure to launch the app before you fully place your phone into the holder. With today’s higher end drones there is usually some set up required before you can fly. First of all, you’ll need to charge your batteries, both for the transmitter and the actual flight battery. This is fairly easy and DJI has done a nice job of integrating both of the batteries into a single charger. Next, you’ll need to be sure to download the DJI Go application so that you can connect it with your Mavic. This does not take too long, although you can expect to spend some time downloading firmware updates before you take off. It’s best if you do all of this in a place with a good WiFi connection – this will ensure that you don’t chew up your phone’s data plan as you get your Mavic set up and configured. The next big thing that you will want to do it go into the DJI Go app and make sure you have set a good altitude for the return to home feature. The only actual “assembly” you have to do is unfolding the quadcopter and putting the propellers on. That’s pretty straight forward and well documented in the quick start guide that comes with the Mavic. After all of that is done, be sure to turn on your remote control first and then the Mavic. Be sure the Mavic is in a clear area where you can see the sky. This will ensure that you get a good number of satellites connected to it. If necessary, you may need to calibrate the compass, which requires a bit of moving the Mavic into different positions – but again, this is documented in the quick-start guide. The DJI Mavic Pro is a blast to fly. It has plenty of power and gets into the air quickly. When you first set it down and turn it on, don’t worry if the propellers are folded. The props are designed to spread into the appropriate position when the motors start to spin. It’s probably best to start in GPS Positioning mode to ensure an easy first flight. You will immediately notice how smoothly the Mavic takes off and how solid it holds in place thanks to the GPS and camera sensors. Once you have mastered the basic hover, take it up above the trees and fly it around a bit. It is great to fly line-of-sight, but it is even more fun to fly it by looking at the live HD video feed that you will get on your mobile device. I have found that flying it higher (around 200 feet) is a great way to start and show beginners how to fly. The reason is because that this height, there is really not much to run into. You can fly around without worrying about trees, wires, phone poles, etc. Once you feel good about flying it in GPS, there is a little switch on the side of the remote control that will allow you t switch to Sport Mode. Let me just say, Sport Mode is INSANE! This thing is so light weight that it will immediately take off and get to nearly 40 miles per hour before you realize you are going that fast. And while the “braking” capabilities of the Mavic are good, keep in mind that you don’t have the use of the sensors while in Sport Mode, so if you head into a tree, you will hit it! But that aside, Sport Mode is a blast to fly as long as you can keep it under control. The DJI Mavic is a game changer. It is not a new or improved version of the Inspire or the Phantom series. 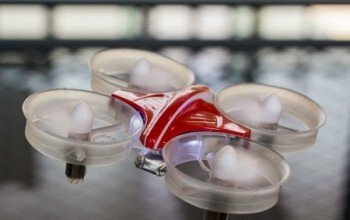 It is a totally new kind of quadcopter. Smaller and more portable, but with so many new features and advances, it is sure to raise the bar for all new drones that come out in 2017 and beyond. If you are considering getting a quadcopter and have a budget of around $1,000 US dollars, I would definitely make sure to try the DJI Mavic Pro. There are faster quads, there are smaller quads, there are quads with better cameras – but the DJI Mavic Pro is the only one that combines those things into a single package. With the vast array of features to explore, the DJI Mavic Pro is a drone that will help you learn to fly and keep you engaged as a drone pilot for a long time to come!